Bioburden is that dirty little topic nobody wants to talk about in mixed company (operations and QA). Bioburden is a contamination that can get into our products at several entry points. Our fundamental responsibility is to eradicate it, but since it is invisible, we often make believe it doesn’t exist. Every pharmaceutical facility has bioburden in most of its rooms and suites and tries to eliminate or reduce it. Bioburden exists in the water systems, product line upstream of our sterilizing filtration, and every corner of our production environment. It is forgotten until there is a “hit” in an environmental monitoring (EM) report. A hit means the amount of bioburden has increased to a level that simple tests have detected it. Bioburden is mobile, growing, contaminating, and touching everything we do, but it can be controlled if we understand it and follow some basic concepts. This discussion will focus on the EU grades B, C, D, and CNC in biotech and aseptic facilities. The mass of bioburden in any given location, call it “Bio,” at any point in time is called Bio(t). K1 is the growth rate of the existing bioburden cells, which is a function of temperature, humidity, anchorage, etc., and K2 is the death rate of the existing bioburden cell, which is also a function of temperature, humidity, anchorage, etc. The key point here is bioburden is a mass that you, the operator of the facility, can control by removing it, reducing its inflow, and providing a hostile environment for it to exist in. Bioburden primarily comes from people shedding microbes from their bodies (face, hair, and hands) and clothing (especially shoes). It is spread by people touching, working, reaching, and generally doing their jobs. Bioburden travels on equipment, materials, bags containing disposables, instruments, tools, and anything being transferred from point to point. Water in most forms contain various bioburden, which spills, drips, and drops. Domestic water, deionized (DI) water, and USP purified water contain various microbes. It should be noted that water for injection (WFI), while not containing bioburden, provides an environment for growth. Unfortunately, there are very few ways to eliminate bioburden because it is a living, growing, replicating, and mobile mass. Sterilization of components entering the suites and rooms has limited practicality for most traffic; however, the use of pre-sterilized components, garments, and tools is important. This is in line with the wide spectrum use of pre-sterilized disposables. This means we should consider pre-sterilized gowns and gamma-irradiated disposable gowns. Furthermore, sanitization or cleaning with an effective disinfectant (e.g., Spor-Klenz, Vesphene, alcohol, bleach) is critical to all surfaces of material containers and equipment coming through the air lock. In fact, the air locks themselves are the most vulnerable part of any facility. The traffic of materials and personnel in most pharma and bio facilities is staggering in terms of square footage of exposed and potentially contaminated surface area. HVAC is a key to removing airborne bioburden as long as the ceiling distribution is symmetrical and the return registers are floor level and evenly distributed around the room. If the facility was designed with the floor level (where the termination of the duct is actually the floor), the HVAC will continuously remove (sweep downward) bioburden on the floor via the air current. As living organisms with a wide variety of bacteria types, and potentially mold, yeast, and fungus, several factors contribute to the growth and spread of bioburden. Moisture in a suite allows the spores to sporulate and the non-spore formers to replicate. This moisture can range from condensation on a vessel or panel, high humidity, or a common water spill that is not cleaned/dried immediately. Operator traffic throughout the suites and across several rooms/suites contributes as well. Any individuals who travel through multiple rooms and do not follow the unidirectional flow spread the bioburden on their gowns across a wide spectrum of the facility. This is compounded if many operators are moving around gathering fittings, getting supplies, stocking process rooms where different products are made, and assisting other operators with sampling and compounding. High traffic in the material and equipment air locks during the shift increases the retention and release of bioburden from the lower classified rooms. This is why air locks must have air changes of the higher grade and careful design for the door systems. Another critical area is the wheels on equipment. Being on the floor, where the maximum gravity-based bioburden resides, the wheels and bioburden “splash” on the underside of carts, skids, and wheeled vessels (including pallet tanks) as they move about. Mechanical or instrument work in any suite, where outside tools, systems, and materials are in tight proximity, also contributes to the growth and spread of bioburden. Another source is media preparation in an open vessel, media powder or liquid spills, and mishandling of EM gear and plates, as well as compounding of sucrose, other sugars and carbohydrates. Worn gypsum board walls, where the edges are paper-based and a natural wicking of moisture occurs, also contribute. Some older-style boards contain cornstarch among other nutrients and serve as core space for mold forms. Flat surfaces are a natural area where bioburden can settle and proliferate. 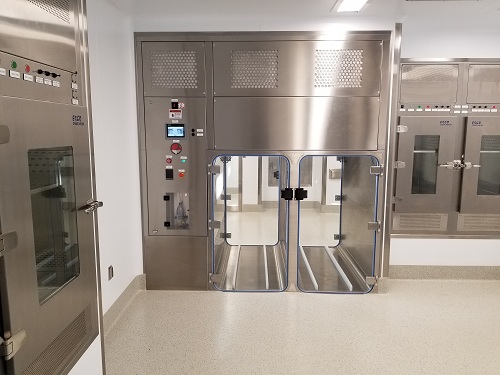 This includes the floor, work/skid surfaces, and any flat horizontal surfaces (e.g., biosafety cabinets, equipment tops, and the tops of free-standing service panels). This is why we need to minimize the design of horizontal surface areas in our facilities and frequently sanitize those areas that must be horizontal. Now that we have looked at the major areas where bioburden can build up and become a recurring problem, let’s examine how we remediate those situations. Moisture needs to be control via diligence in cleaning/drying and by keep the RH (relative humidity) set point as low as the HVAC system allows: 40 percent is good. Depending on the plant’s location, a Kathabar or other desiccant system may be needed. Operators should follow a unidirectional path when working in a grade D, C, or B classified area and cannot “freelance” from suite to suite. The path must never cross over or backtrack. This includes the personnel air locks and the gowning rooms. Clean/freshly gowned personnel should never come into the same room or in contact with personnel who are finished working in a product area or exiting after a shift. This promotes the transfer of bioburden (and cross-contamination). Being the single most vulnerable area in the plant, the air locks need to be washed down after every shift (floors, walls, and ceilings). Timers controlling magnetic locks on air lock doors can prevent operators from shortcutting “air lock dwell” times, maximizing the air “washing” of that important step. Depending on the classification and operation, the cleaning regimen for rooms will vary, but as a general starting point operating rooms need the floors washed daily, the walls twice a week, and the ceilings every two weeks. The use of single-use systems needs to be evaluated to eliminate the movement of equipment from room to room. If wheeled equipment is a continual need, the wheels and bearings need to be sprayed with alcohol at every transfer, and the underside of the equipment needs to inspected/cleaned each time it is used. All tools needed in a classified area must be disinfected or sterilized before use, and mechanical crews need to gown and conduct themselves in classified areas the same way the operators do. Any nutrient material used inside a classified area for compounding that must be opened should be opened and manipulated under a HEPA-filtered dust collection system to minimize the spread of the powder. This is also an excellent opportunity for the purchase of media or material prepackaged in a single-use disposable container that connects directly to the process transfer system. Cleaning frequently, correctly and passionately can overcome design flaws. Bio and pharma operating areas should not have excessive flat surfaces or ledges, and if they do, they need to be easily accessible for cleaning. Lastly, the physical rooms need to be inspected every quarter for worn, wet, moist walls and breaches in the wall coating. Cuts and breaches can be covered with a single-sheet polymer (Mipolam, Kydex, etc.) that will encapsulate the damaged wall. Construction in pharmaceutical facilities needs to focus on using polymer wall and ceiling systems or at a minimum polymer-encased rock boards. There is an array of technologies designed to reduce bioburden on materials passing into and out of rooms. One example is material pass-through boxes, those nice shiny boxes with polycarbonate doors. As a passive system, they rely on an operator wipe-down for reduction of bioburden. Active HEPA-filtered pass boxes take the passive box and provide an engineered method of bioburden reduction by “washing” materials with filtered air. Often these boxes incorporate a timer and interlocked doors to reduce the reliance on SOPs. 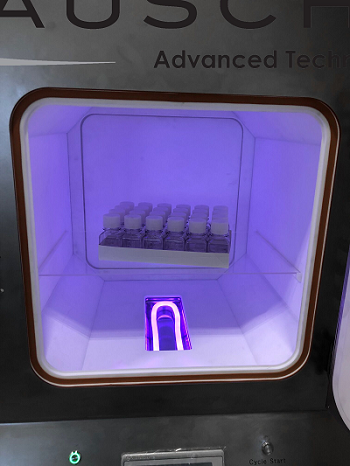 Adding vaporized chemical sterilizing/sanitization agents (e.g., hydrogen peroxide, chlorine dioxide, nitrogen dioxide) to the material pass-through provides an increased level of bioburden reduction over active pass boxes. The vaporized/gaseous nature of the agents allows hard-to-clean areas (e.g., cart castors) to be sanitized. Ultraviolet C (UVC) treatment for reduction of bioburden has been around for a while, but with limited adoption by the industry. There have been some recent advances in the application that make it worth considering. When you need absolute certainty of bioburden removal and the materials are robust, an autoclave may be your answer. Autoclaves continue to be incorporated into modern facilities for transition materials from grades C to B. The nuclear option, electron-beam processing, is typically only used to transition components into an isolator for high-speed filling lines. Some of our most interesting observations in this area come from a few plants. In Puerto Rico (PR), there is a biotech facility that was designed in the late 1980s and did not embrace a number of the modern design features of unidirectional flow. Their HVAC had the supply and return mounted in the ceiling. However, they have the lowest bioburden numbers among their U.S. counterpart facilities. They accomplished this first by installing a desiccant system in their HVAC system, running the RH at 40 percent throughout the operating suites, and keeping the temperature of all the rooms at 62 to 65 degrees Fahrenheit. The second, more important, aspect is their regimented cleaning program, in which basically every operator is cleaning when not operating, in addition to the normal internal cleaning crews. A peer plant which was new and recently commissioned was plagued with bioburden that prevented it from starting up. The core problems came down to two main issues: 1) The operators did not clean during their shifts and left it to the midnight outsourced cleaning crew. The outsourced team was in a contract dispute and neglected its duties. 2) The internal operating personnel were not trained, exhibited incomplete gowning, and used poor GMP practices, to the level that the material and equipment air locks doubled as conference rooms where documents, clipboards, pens, etc. were exchanged between gowned and ungowned personnel across a yellow line painted on the floor. Behaviors, design, and constant evaluation make for a low bioburden and successful plant. We can summarize a few key points: Architectural features and finishes that improve cleanability or provide an inert surface (polymer systems) are important to minimize the collection and retention of microorganisms. However, this is only a passive method to prevent bioburden dispersion and cannot alone solve any problem. HVAC, when designed correctly, is a key active mechanical method of removal, but it requires floor-level returns and a symmetrical supply and return scheme to be effective. Water systems and moisture must be monitored and always contained, and if there are any wash areas or utility zones, they must be air-locked separately, exhausted to the exterior, and put in a suite not directly accessible to the processing suites. This is also a passive mechanism. Aseptic techniques of the operators, the use of their hands, and complete and proper gowning will actively reduce the supply side of bioburden. Sanitization (washing equipment and rooms) and converting to disposables are active methods to reduce bioburden. Erich H. Bozenhardt is the process manager for Integrated Project Services’ process group in Raleigh, North Carolina. He has 13 years of experience in the biotechnology and aseptic processing business and has led several biological manufacturing projects, including cell therapies, mammalian cell culture, and novel delivery systems. He has a bachelor’s of science in chemical engineering and an MBA, both from the University of Delaware. He can be reached at via email at ebozenhardt@ipsdb.com and on LinkedIn.